My dear friend Michele at Smile, Wink, Nod posted a wonderful link today, so I have to thank her for helping me find this! How could I have missed this sweet bunch of miniature printables at Hitty Print Mini? Oh, never mind, at least I know about it now! And I thought you would want to know as well. Today we made the dolls a bunch of books for the doll house! These were so cute printed out!! A page of book covers. 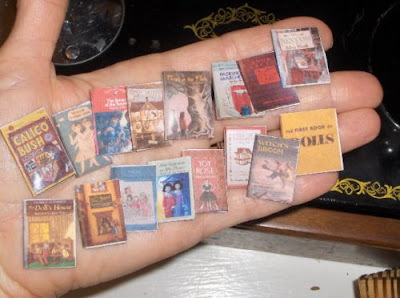 I simply cut out each tiny book cover, folded it in half, and then glued it with a glue stick around a piece of nice smooth cardboard (think thick card stock). Just to show you how mini they really are. 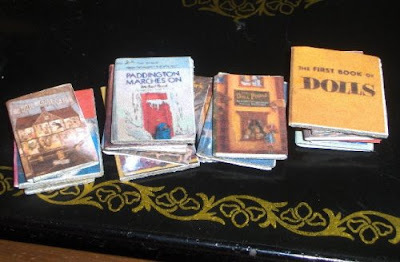 You know now I must make a doll house bookshelf. These dolls love books! I love these dolls. I forgot about all the pintables on the Hitty site. Julie who owns this site is a wonderful person and so giving. I use to be very active on the Hitty yahoo group, but due to time, I have not been able to keep up with the group… Have you and the princess read the book Hitty yet? I was taking a break from school work and holiday prep and on your suggestion went to the Hitty site. I was fasinated. What a delightful little adventure! I had never heard of Hitty dolls before but was enamored with the stories, and the print outs of the book jackets,labels,etc. What a great find for the dollhouse! I have put my Gingerbreadhouse on display for the holidays and while on Christmas break will begin my next project.It is a three story Victorian I think will become the next Gingerbreadhouse in what could become a small village someday! Thanks again for the tip! Louise, I've been meaning to answer you! Too busy here! Believe it or not, it was my oldest son and I who read Hitty. I am really looking forward to reading it with my daughter soon. Diane, the Gingerbread village sounds lovely! Isn't this Hitty site cute?